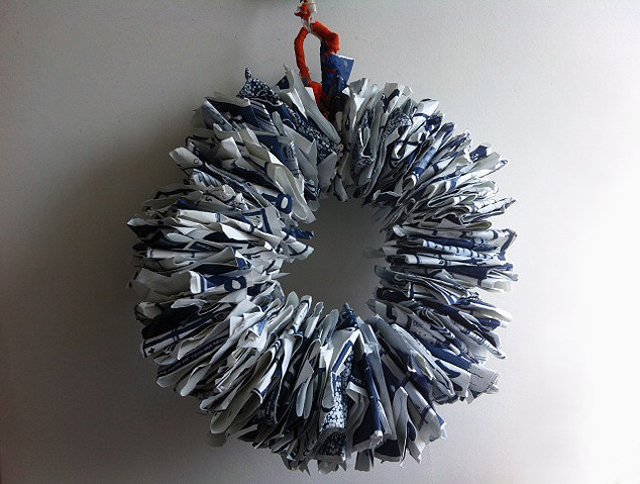 Wreath of scrunched up pages of old Blue & White calendars. Mottainai incarnate! WA can mean so many things in Japanese: first of course is peace, harmony. It can also be a circle, as in a circle of reconsecrated calendar pages. Or a circle of friends like you who read these words, and our Blue & White circle of friends. And it can go so far as to mean Wow! Joy! December has a way of celebrating important landmarks in life. 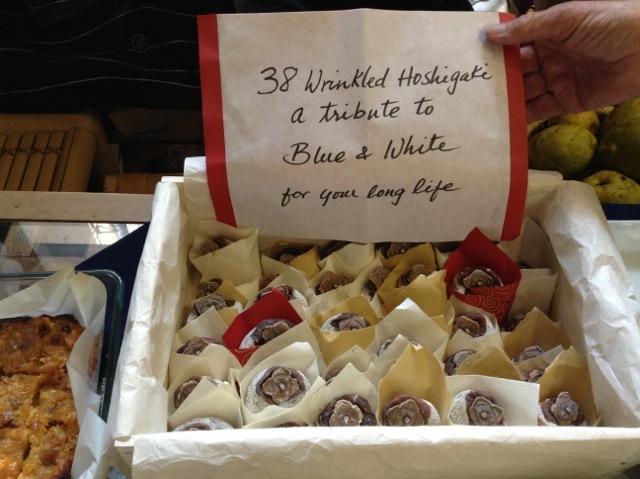 Blue & White’s Birthday, the 38th – imagine! 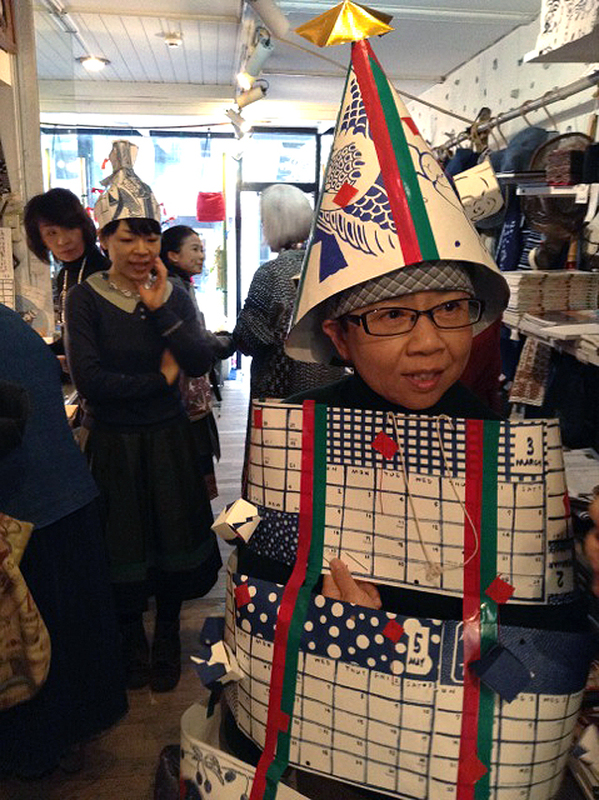 Reiko Hagiya in birthday suit she made of reused Blue & White calendar pages with her resourceful husband Seiichi. The end of the year. The culmination of many things accomplished over the months past. On the 7th of the month we had our Blue & White birthday party and loyal fans came out in full force to make the day not simply a birthday, but a landmark, commemorating all that Blue & White believes in – The Beauty of Japan ! Dried persimmons from a farmer in Nara, artfully arranged in washi pockets – a gift of grace from Sumiko Enbutsu. 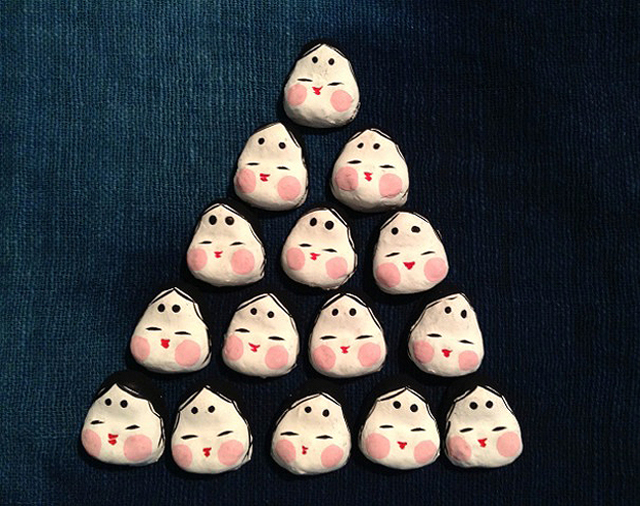 Mini Washi Otafuku masks by Fusamoto Kenji. The energy and purity of things made by hand. The heavenly origins of blue. The cosmic inspiration of blue and white. The importance, the energy of neighborhood – Azabu Juban is one of Tokyo’s coziest and most variegated. The fun of putting opposites together and seeing the combustion that results: blue and white, old and new, serious and playful, surprise and expected. 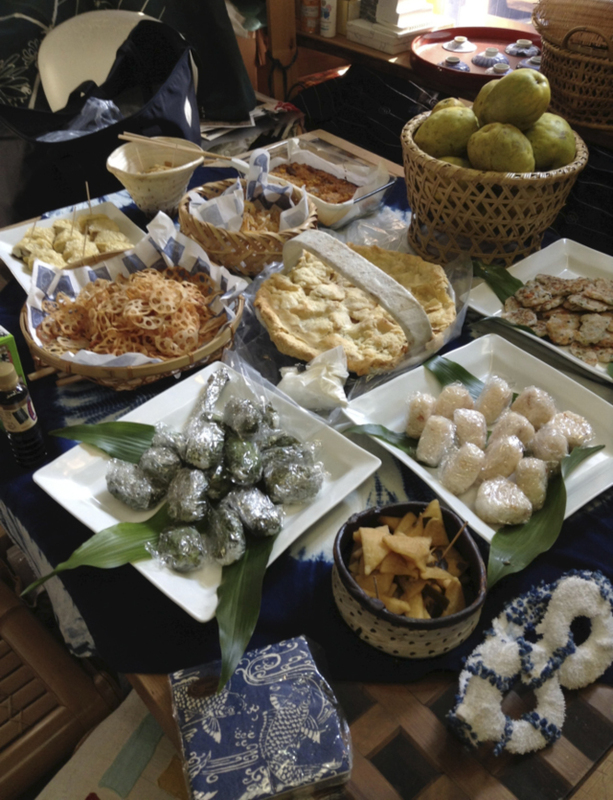 Birthday feast by Reiko Okunushi and other great cooks. The celebration of Christmas, though foreign to Buddhist philosophy, is still very popular amongst shopkeepers and their customers. 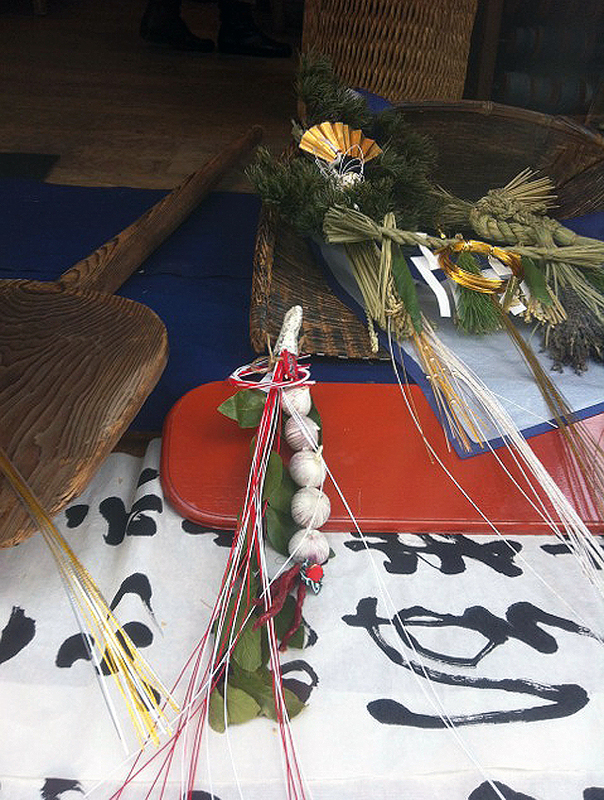 Mottainai Christmas decoration of cut off ends of tenugui tied to a network garden trellis. 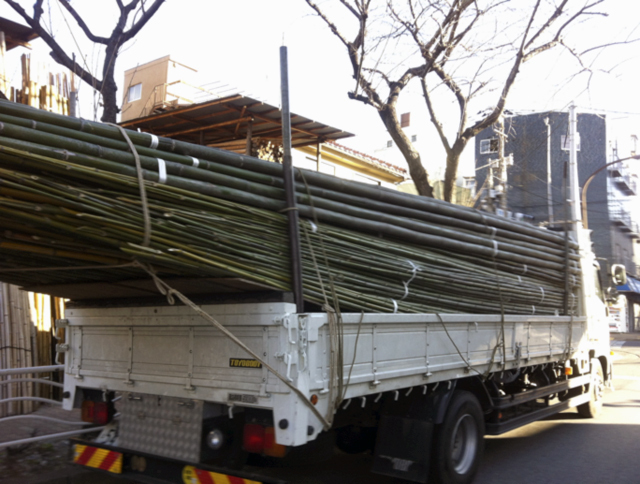 Bamboo transported to our local bamboo craftsman for making Kadomatsu New Year’s Decorations and other auspicious New Year’s installations. 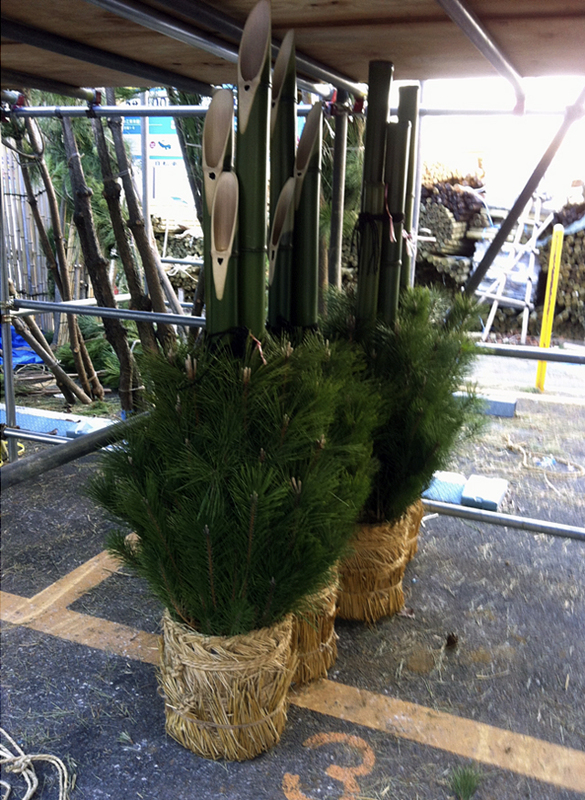 Kadomatsu of Pine Bamboo and rice straw – three auspicious plants. 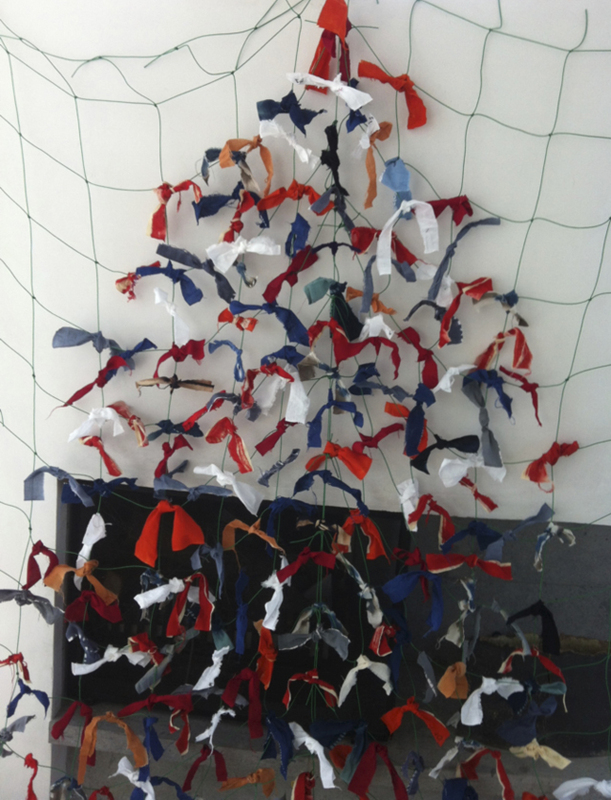 Shime Kazari, New Year’s decorations by Takako Nishikawa of Ishikawa Prefecture. There are many ways of expressing the joy of the New Year. 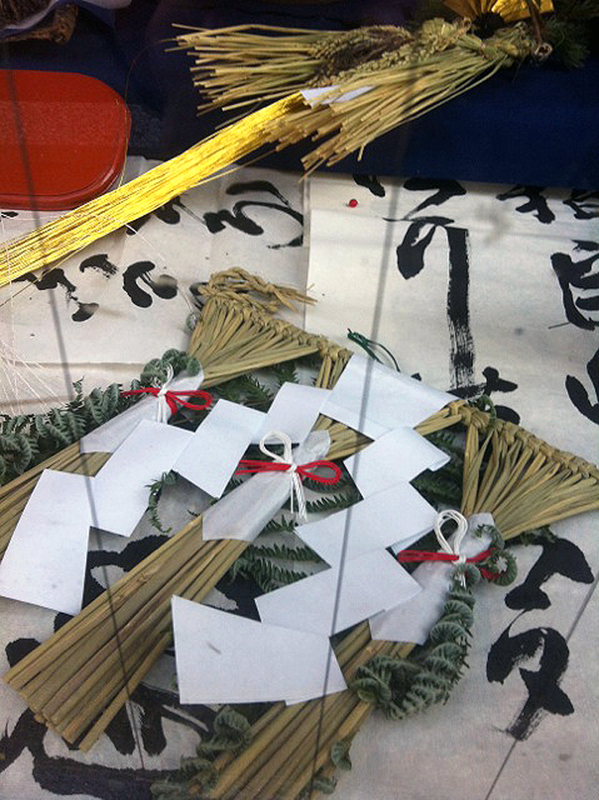 The rice straw shimenawa of Takako Nishikawa are fresh and original creations that filled our window with their spirit of pure and fresh new beginnings. She takes the tradition of using sacred straw rope and washi and paper mizuhiki made in Ishikawa, and gives them a new twist with garlic bulbs and red peppers and other surprises. 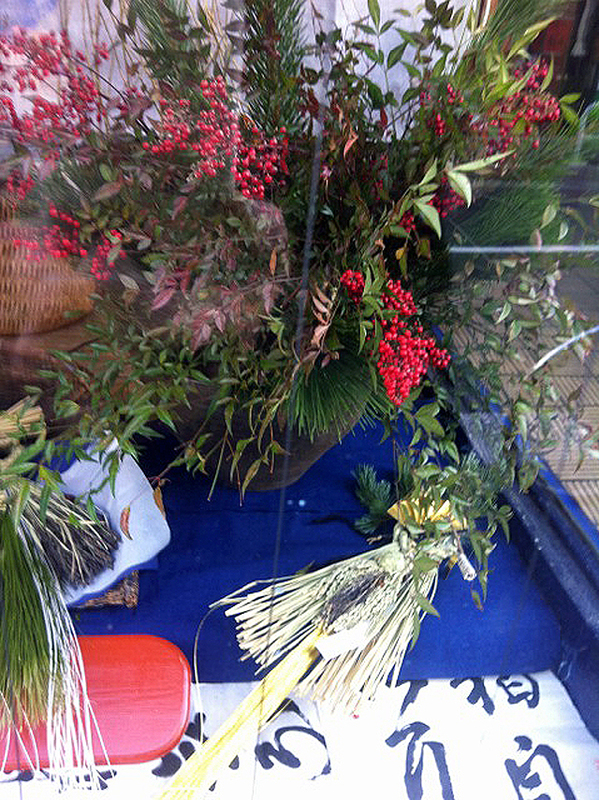 Nishikawa san used nandina red berries and sharp black sumi calligraphy to give old traditions new freshness and punch. Totally new, totally original, Nishikawa san’s New Year’s decorations are a heartfelt message of renewal and purification. 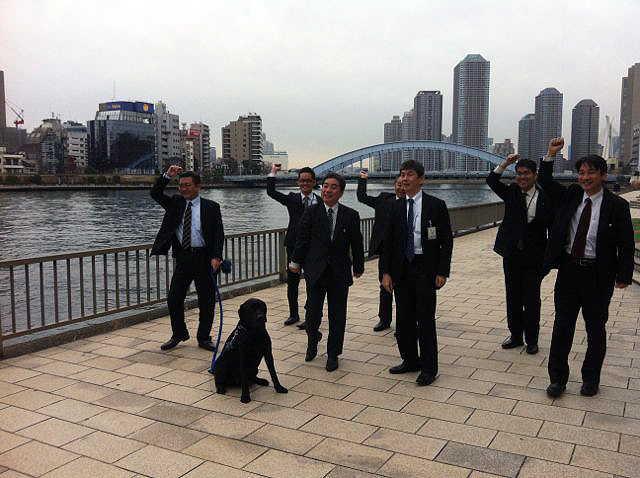 The last hurrah on an early morning Sumida River dog walk. 7 serious office workers practice for an upcoming birthday party and invite our black dog Basho to join the dance. Joy and Peace and WOW! to all from Blue and White and friends. 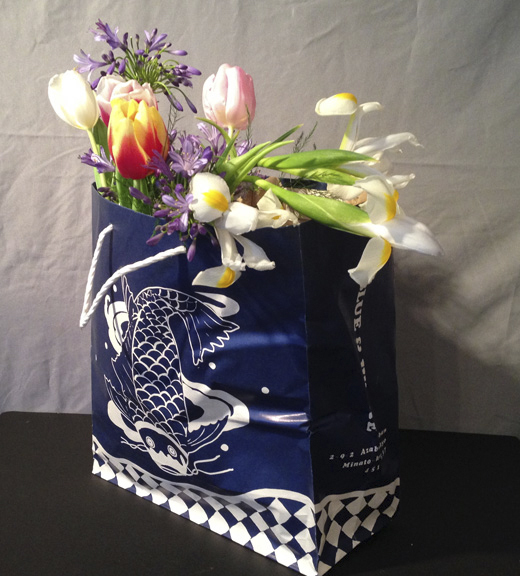 A lovely tribute by Susan Detjens’ FLower Flinging blog. Happy Birthday Blue & White! 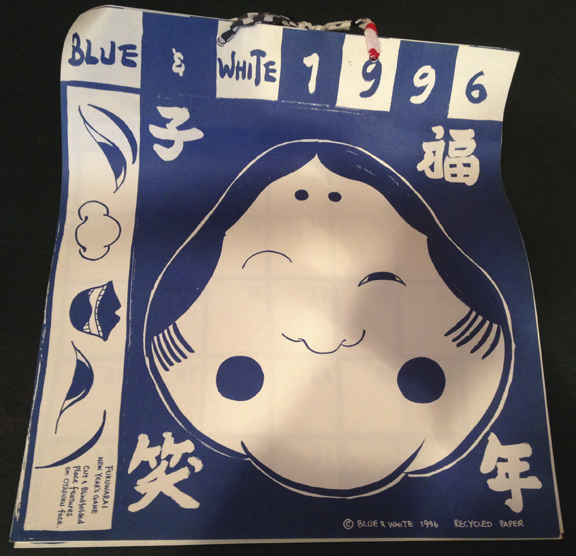 While the dense snows piled up yesterday, I took a most magical walk down memory lane with the discovery of the “Blue & White” blog posting, forwarded to me by Mrs. Olana. 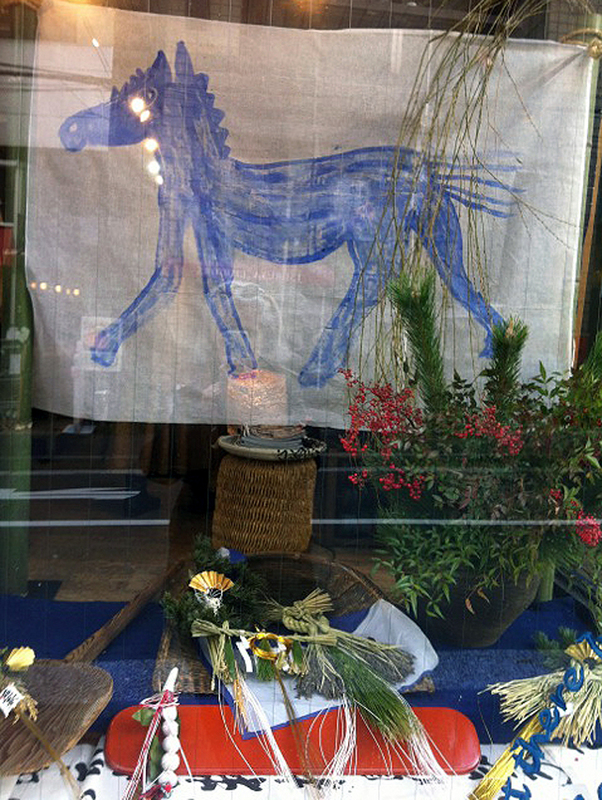 Blue & White is the iconic Tokyo shop of Amy Sylvester Katoh and is currently celebrating its 38th birthday! 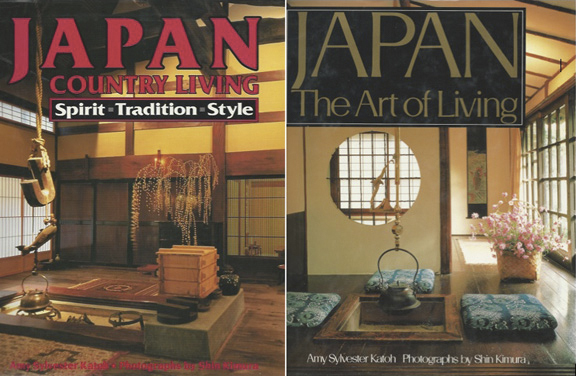 At a time when Japan was rushing to modernism and western goods, Amy embraced the vanishing folk art skills that were the heart of Japanese culture. She founded Blue & White to showcase the hand-made, to celebrate the dearly original ideas of hidden crafts men and women and to find new audiences for their work. When our young family moved to Tokyo, Amy and I met through mutual friends while our children were in school together. She introduced me to the fascinating world of antique sales held in temples and shrines and, on Sundays, together we roamed Tokyo. Amy is the author of 4, soon to be 5, wonderful books. 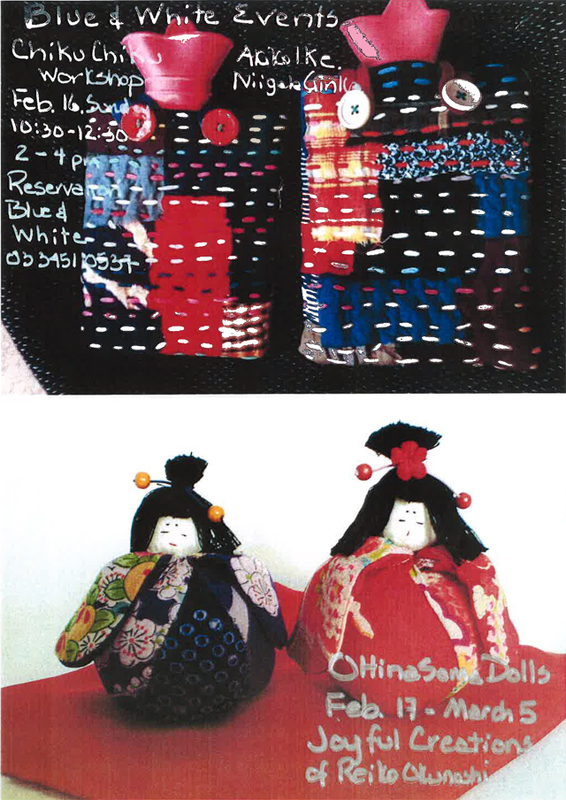 Each one is imbued with her warmth and her ever-generous enthusiasm as she shares what fascinates her about Japan and Japanese style, the essential and honest truth of objects crafted with love. Her blog achieves the same resonance of spirit. We had great fun amassing the beginnings of a Japanese guidebook together before the exigencies of my leaving Tokyo for London got in the way. Fast forward a number of years later, another project loomed. Japan Collages. Amy invited me to do a mixed media show celebrating Japanese life in the ‘city-village’ that is Azabu Juban. 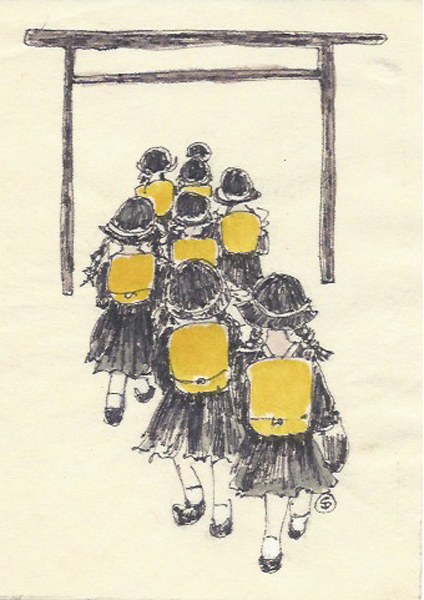 These schoolgirls were featured on a set of notecards. The first in the tradition of the hand-made books that I still make today, “Azabu Juban” was my love-letter to this unique area. 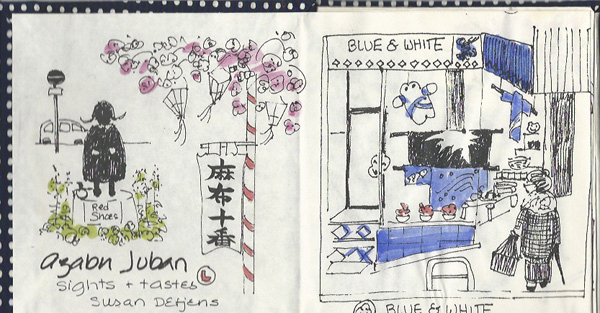 It was formatted in an 18 page accordion-fold book with yukata fabric covers and hand colored drawings. 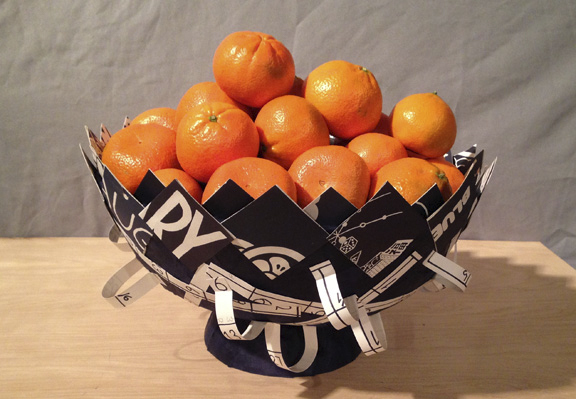 The Blue & White blog post that inspired this reminiscence was a delightful compilation of many clever craft projects using the Blue & White annual calendar. Check out the blog: https://blueandwhitetokyo.com/2013/12/05/december-already/. I have a pile of these calendars that mark our lives as expats. Trips, parties, language lessons, visitors, school events…they are all there. It became a challenge to decide how to use the calendars without destroying these memories. In the end I decided my Blue & White challenge would be to make a blue and white bowl to celebrate my friend’s anniversary. 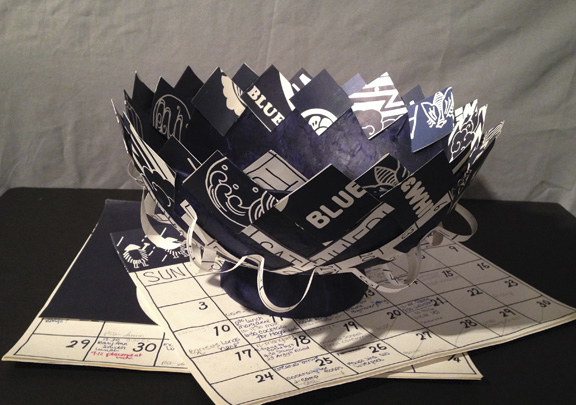 As we did not usually spend July and August in Japan, I sacrificed those mostly empty pages to create the bowl above, using a deep indigo artist’s paper as the background. The technique is much the same as in the container in the last post “Flora for a Young Girl“. Happy Birthday Blue & White! Congratulations Amy-chan and to everyone who keeps the shop humming. We so miss you, all the doings and all the fun. Happy New Year and Happy Birthday Blue & White! Amy, I miss you and everything Japan every day, but loving my new adventures too! Hope to see you soon – maybe March! Wow, 38 years old (in 2014)!! How did that happen?!? Omedetoh, Amy and Blue & White, from Los Angeles! You are a national treasure! My memories of your shop are entwined with my time in Tokyo in the mid-80s. I’ll be sure to stop in when I’m next in Japan.